When we think about getting plenty of vitamins in our daily diet most of us think about fruit and vegetables. Well, while it’s true that fruit and veg are essential for good nutrition, there are plenty of vitamins in other food sources too. Dairy products contain many nutrients that are important for good health and nutrition. Vitamin A, also known as retinol, is essential for your vision, your skin and for a healthy immune system. Most people think about carrots when they consider vitamin A. Actually, there isn’t any vitamin A in carrots, but they do contain beta-carotene, which your body can turn into vitamin A. Fewer people would come up with ‘dairy products’ as an answer to where they can find this all-important nutrient. 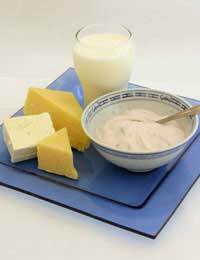 But full fat dairy products – milk, butter, yoghurt and cheese – are really good sources of vitamin A. Of course, it’s essential not to get too carried about and feast too heavily on full-fat cheeses. Those carrots do have their benefits you know! Vitamin B2 is good for growing bodies and is essential in helping your body release energy from food. Also known as riboflavin, you’ll find plenty of this vitamin in cheese as well as the – perhaps less exciting – green, leafy vegetables. It just goes to show that, despite the claims of many faddy diets, there is rarely such a thing as a ‘bad’ food. Eaten in moderation, even high fat foods like cheese can have their benefits. Vitamin B12 helps you release energy from food and is important for the production of red bloods cells. Vitamin B12 is unusual in that it is not found in plant-based foods. You can get your vitamin B12 from dairy products, so adding some milk or yoghurt to your daily diet is a good idea. Because vitamin B12 is only found in animal based products and dairy foods, vegans can struggle to get enough vitamin B12. We need vitamin D in order to absorb calcium – an essential for teeth and bones. We get most of our vitamin D from exposure to sunlight. But we can get vitamin D from our food too. Dairy products are a particularly good way to make sure you get plenty of vitamin D.
Although not a vitamin in itself, calcium is certainly an important nutrient, so it’s worth taking a moment to consider calcium when we’re thinking about the nutritional value of dairy products. Calcium is essential for healthy, strong bones and teeth and there’s plenty of calcium to be had in dairy products such as cheese, milk, cream and butter. But remember that your body can’t absorb calcium without vitamin D. So when you eat a piece of cheese the vitamin D and calcium work together to help keep your bones healthy. More and more people these days are choosing to avoid eating dairy products. This can be for many reasons, particularly because many dairy products are comparatively high in fact. But while it’s true that you don’t need to eat dairy products regularly to get sufficient quantities of your essential vitamins, they can be a good source of vitamins and other nutrients. Remember, where diet is concerned, moderation and balance are key. So a few bites of your favourite cheese can be a wise and healthy choice. But don’t kid yourself. A diet rich in cheese, butter, ice cream and cream cakes with no fruit and vegetables isn’t a good idea!